Generates graphs based on navmeshes. Navmeshes are meshes where each triangle defines a walkable area. These are great because the AI can get so much more information on how it can walk. Polygons instead of points mean that the funnel smoother can produce really nice looking paths and the graphs are also really fast to search and have a low memory footprint because fewer nodes are usually needed to describe the same area compared to grid graphs. Returns a new transform which transforms graph space to world space. Does not update the transform field. Scans the graph using the path to an .obj mesh. Determines how normals are calculated. Disable for spherical graphs or other complicated surfaces that allow the agents to e.g walk on walls or ceilings. 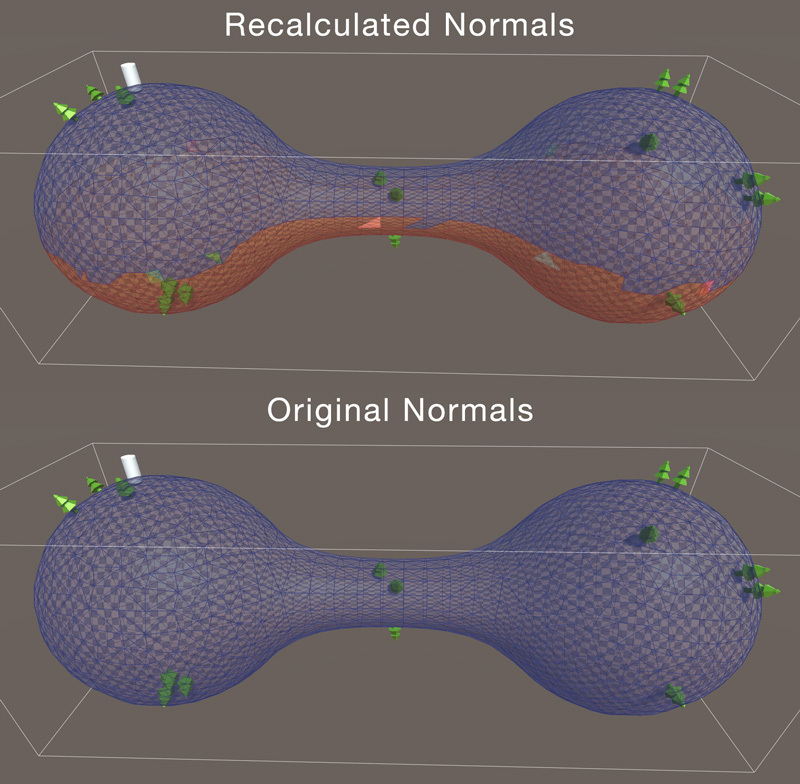 By default the normals of the mesh will be flipped so that they point as much as possible in the upwards direction. The normals are important when connecting adjacent nodes. Two adjacent nodes will only be connected if they are oriented the same way. This is particularly important if you have a navmesh on the walls or even on the ceiling of a room. Or if you are trying to make a spherical navmesh. If you do one of those things then you should set disable this setting and make sure the normals in your source mesh are properly set. If you for example take a look at the image below. In the upper case then the nodes on the bottom half of the mesh haven't been connected with the nodes on the upper half because the normals on the lower half will have been modified to point inwards (as that is the direction that makes them face upwards the most) while the normals on the upper half point outwards. This causes the nodes to not connect properly along the seam. When this option is set to false instead the nodes are connected properly as in the original mesh all normals point outwards. The default value of this field is true to reduce the risk for errors in the common case. If a mesh is supplied that has all normals pointing downwards and this option is false, then some methods like PointOnNavmesh will not work correctly as they assume that the normals point upwards. For a more complicated surface like a spherical graph those methods make no sense anyway as there is no clear definition of what it means to be "inside" a triangle when there is no clear up direction. Mesh to construct navmesh from. Reference to the AstarPath object in the scene. Number of nodes in the graph. Note that this is, unless the graph type has overriden it, an O(n) operation. This is an O(1) operation for grid graphs and point graphs. For layered grid graphs it is an O(n) operation. Enable to draw gizmos in the Unity scene view. In the inspector this value corresponds to the state of the 'eye' icon in the top left corner of every graph inspector. Should navmesh cuts affect this graph. End batch updating of tiles. During batch updating, tiles will not be connected if they are updating with ReplaceTile. When ending batching, all affected tiles will be connected. This is faster than not using batching. Returns the nearest node to a position. Returns the nearest node to a position using the specified NNConstraint. Can for example tell the function to try to return a walkable node. If you do not get a good node back, consider calling GetNearestForce. Can be passed to enable some graph generators to find the nearest node faster. Returns the nearest node to a position using the specified constraint . an NNInfo. This method will only return an empty NNInfo if there are no nodes which comply with the specified constraint. Calls a delegate with all nodes in the graph until the delegate returns false. Calls a delegate with all nodes in the graph. This is the primary way of iterating through all nodes in a graph. Do not change the graph structure inside the delegate. Tile at the specified x, z coordinate pair. The first tile is at (0,0), the last tile at (tileXCount-1, tileZCount-1). Returns a bounds object with the bounding box of a group of tiles. The bounding box is defined in world space. Returns an XZ bounds object with the bounds of a group of tiles in graph space. Returns the tile coordinate which contains the specified position. It is not necessarily a valid tile (i.e it could be out of bounds). Tile coordinates from a tile index. Tile index from a vertex index. Returns a rect containing the indices of all tiles touching the specified bounds. If a margin is passed, the bounding box in graph space is expanded by that amount in every direction. Returns a rect containing the indices of all tiles by rounding the specified bounds to tile borders. This is different from GetTouchingTiles in that the tiles inside the rectangle returned from this method may not contain the whole bounds, while that is guaranteed for GetTouchingTiles. Vertex coordinate for the specified vertex index. Vertex coordinate in graph space for the specified vertex index. Index of the graph, used for identification purposes. Used as an ID of the graph, considered to be unique. Used in the editor to check if the info screen is open. Default penalty to apply to all nodes. Returns if there is an obstacle between origin and end on the graph. This is not the same as Physics.Linecast, this function traverses the graph and looks for collisions instead of checking for collider intersection. Point to start from. This point should be on the navmesh. It will be snapped to the closest point on the navmesh otherwise. If you already know the node which contains the origin point, you may pass it here for slighly improved performance. If null, a search for the closest node will be done. If a list is passed, then it will be filled with all nodes along the line up until it hits an obstacle or reaches the end. This is not the same as Physics.Linecast, this function traverses the graph and looks for collisions instead of checking for collider intersections. This method only makes sense for graphs in which there is a definite 'up' direction. For example it does not make sense for e.g spherical graphs, navmeshes in which characters can walk on walls/ceilings or other curved worlds. If you try to use this method on such navmeshes it may output nonsense. Perform nearest node searches in XZ space only. Recomended for single-layered environments. Faster but can be inaccurate esp. in multilayered contexts. You should not use this if the graph is rotated since then the XZ plane no longer corresponds to the ground plane. You can also control this using a field on an NNConstraint object. Draw gizmos for the graph. Called when tiles have been completely recalculated. This is called after scanning the graph and after performing graph updates that completely recalculate tiles (not ones that simply modify e.g penalties). It is not called after NavmeshCut updates. Is the graph open in the editor. Finds the first node which contains position. 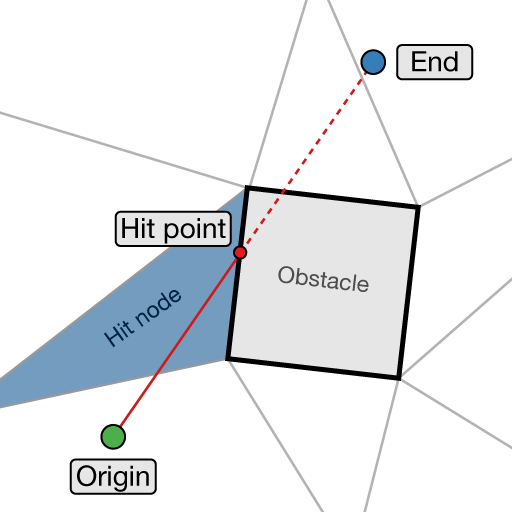 "Contains" is defined as position is inside the triangle node when seen from above. So only XZ space matters. In case of a multilayered environment, which node of the possibly several nodes containing the point is undefined. Returns null if there was no node containing the point. This serves as a quick check for "is this point on the navmesh or not". Note that the behaviour of this method is distinct from the GetNearest method. The GetNearest method will return the closest node to a point, which is not necessarily the one which contains it in XZ space. Moves the nodes in this graph. Multiplies all node positions by deltaMatrix. For grid graphs, navmesh graphs and recast graphs it is recommended to use their custom overloads of the RelocateNodes method which take parameters for e.g center and nodeSize (and additional parameters) instead since they are both easier to use and are less likely to mess up pathfinding. This method is lossy for PointGraphs, so calling it many times may cause node positions to lose precision. For example if you set the scale to 0 in one call then all nodes will be scaled/moved to the same point and you will not be able to recover their original positions. The same thing happens for other - less extreme - values as well, but to a lesser degree. Moves all the nodes in such a way that the specified transform is the new graph space to world space transformation for the graph. You usually use this together with the CalculateTransform method. This will move all the nodes to new positions as if the new graph settings had been there from the start. RelocateNodes(deltaMatrix) is not equivalent to RelocateNodes(new GraphTransform(deltaMatrix)). The overload which takes a matrix multiplies all existing node positions with the matrix while this overload does not take into account the current positions of the nodes. Replace tile at index with nodes created from specified navmesh. This will create new nodes and link them to the adjacent tile (unless batching has been started in which case that will be done when batching ends). The vertices are assumed to be in 'tile space', that is being in a rectangle with one corner at the origin and one at (TileWorldSizeX, 0, TileWorldSizeZ). The vertex and triangle arrays may be modified and will be stored with the tile data. do not modify them after this method has been called. Consider using AstarPath.Scan() instead since this function only scans this graph and if you are using multiple graphs with connections between them, then it is better to scan all graphs at once. Show an outline of the polygons in the Unity Editor. Show the surface of the navmesh. Show the connections between the polygons in the Unity Editor. Start batch updating of tiles. Number of tiles along the X-axis. Number of tiles along the Z-axis. Determines how the graph transforms graph space to world space. Clear the tile at the specified coordinate. Must be called during a batch update, see StartBatchTileUpdate. Generate connections between the two tiles. The tiles must be adjacent. Create connections between all nodes. Deserializes graph type specific node data. Destroys all nodes in the graph. This is an internal method. Unless you have a very good reason, you should probably not call it. True if the graph exists, false if it has been destroyed. Fills graph with tiles created by NewEmptyTile. Creates a single new empty tile. Function for cleaning up references. This will be called on the same time as OnDisable on the gameObject which the AstarPath script is attached to (remember, not in the editor). Use for any cleanup code such as cleaning up static variables which otherwise might prevent resources from being collected. Use by creating a function overriding this one in a graph class, but always call base.OnDestroy () in that function. All nodes should be destroyed in this function otherwise a memory leak will arise. Called after all deserialization has been done for all graphs. Internal method to scan the graph. Called from AstarPath.ScanAsync. Override this function to implement custom scanning logic. Progress objects can be yielded to show progress info in the editor and to split up processing over several frames when using async scanning. Any other information necessary to load the graph in-game All settings marked with json attributes (e.g JsonMember) have already been saved as graph settings and do not need to be handled here. It is not necessary for this implementation to be forward or backwards compatible. An old format for serializing settings. This is deprecated now, but the deserialization code is kept to avoid loosing data when upgrading from older versions.